(Recto) blindstamp at lower left: "COPYRIGHTED 1904 / BY E.S. 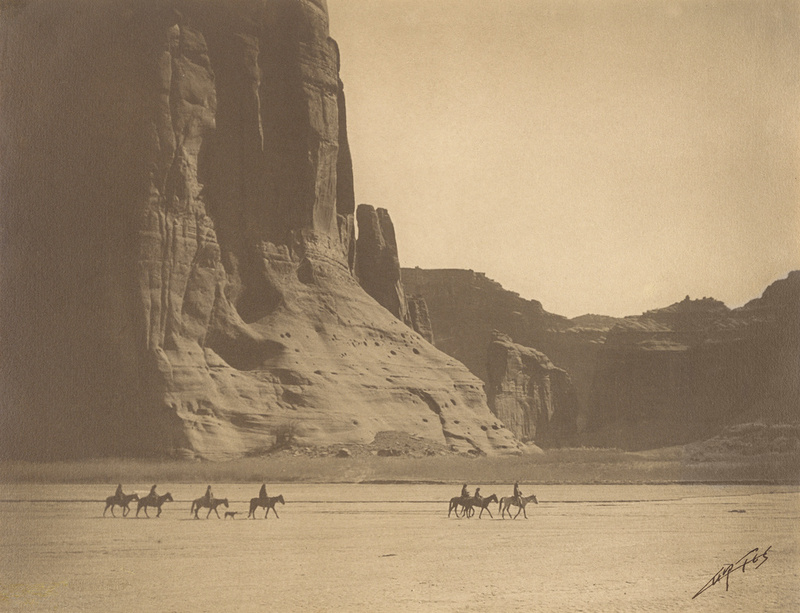 CURTIS"
(Recto) signed in black ink, at lower right: "CURTIS"
Curtis's depiction of Navajos crossing the desert on horseback, their graceful silhouettes at the base of Arizona's Canyon de Chelly, betrays a romantic view of the past. As the western United States developed, Curtis endeavored to record the vanishing cultures of the land's original inhabitants. His work, which was sometimes choreographed and often printed in platinum--a luxurious medium associated with artistic movements of the day--combines documentary and aesthetic approaches.